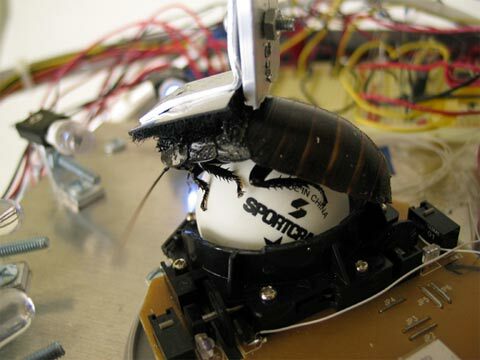 RobotRoach, Cockroach Controlled Cyborg | OhGizmo! So I’m still trying to figure out just why anyone would want to make this. Garnet Heartz, the designer, has a ton of reasons, I just can’t bring myself to read the whole article. You can try, here. Point is, it’s a nifty little contraption. So yeah, ok, here’s the gist. There’s a three wheeled robot. There’s a ping-pong trackball. And then there’s a Madagascan hissing cockroach (I just love how it’s a “hissing” cockroach). The roach is tied atop the ball via velcro magic and its skittery little movements are then relayed to the three wheeled bot, which responds in kind. In other words, you have a remote controlled bot, with a roach doing the “controlling”. The article again. Story VIA GearLive. It’s another gadget blog. Yes I know these are a dime a dozen but, it was this crazy cockroach robot thing that sold me on it…. I have to believe MH cockroaches have better things to do with their time.